the décor of her living room. wall to wall white carpet wasn’t cutting it. but she is really happy now with the wood floors). She did a great job picking out the fabrics! and a tray to update the coffee table. and it really is timeless. Since her sconces were silver, I suggested silver accents. And balance in the other corner with a fiddle leaf fig tree. 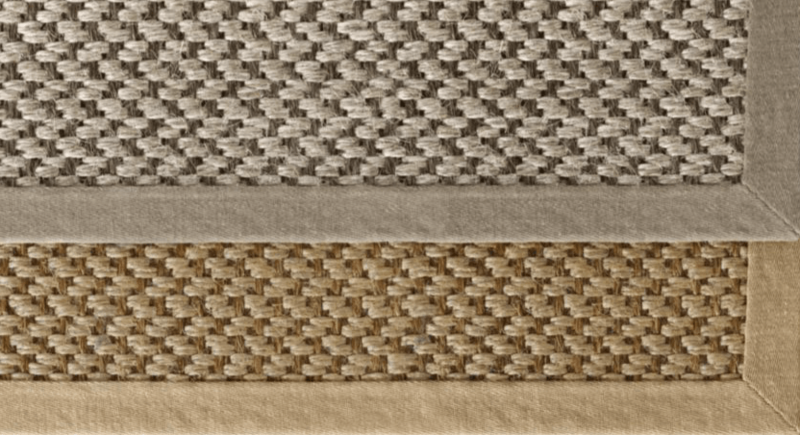 or a soft natural Belgian sisal from Restoration Hardware. She’s having drapes made for the far window that match the pretty ones on the opposite wall…all about symmetry. (Not that big a deal but, I told her I would have made the center sofa pillows larger, at least 22″. She decided to redo them). My client has great taste. But sometimes an extra pair of eyes is needed. Next, I’m starting on her dining room. please check out My Services page. What a fun surprise clicking in here to see my sister's living room Mary Ann! It looks fantastic! You did a great job helping her get this room pulled together. I texted with her this morning and we both agree…so many things that we would not have thought of. This is why you need to call in a pro! Huge fan of e-design! 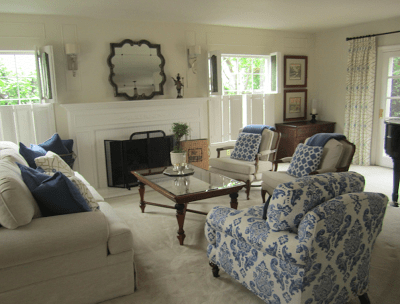 Great job Linee and Mary Ann….beautiful room! Simply beautiful. What a fresh and special room. I love it!! Oh, I love this so much! Gorgeous!! What a difference the floor made. Pretty pretty room. Love the new fresh room and the beautiful wood floors. Great job! Thank you so much Mary Ann! You can be my "bad guy" anytime. My room was so blah and I was just stuck. You gave me great input and ideas and now look! This room puts a big smile on my face. Thank you, Thank you, Thank you! What a beautiful room. 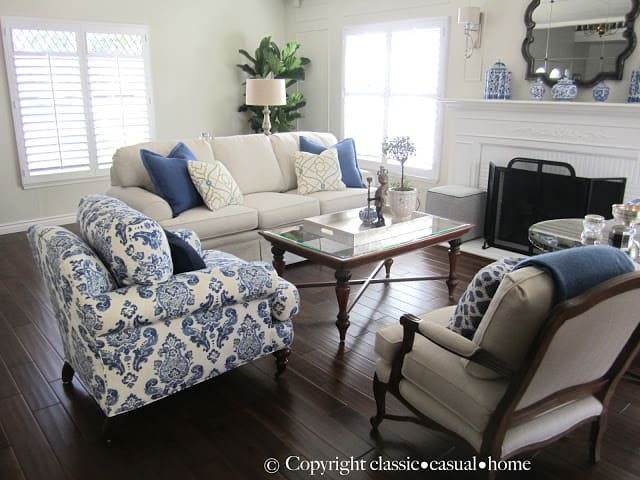 I think the blue and white looks so good next to the white furniture. 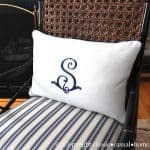 Got a few ideas here, also loved your guest post at Enchanted Home. What a difference changing the flooring makes! What a pretty room! Pretty! Thanks to you and your client for sharing. I really love the dark hardwood in contrast with the neutrals and an area rug is going to be perfect. I like how you updated the coffee table with the tray. The floor is beautiful. 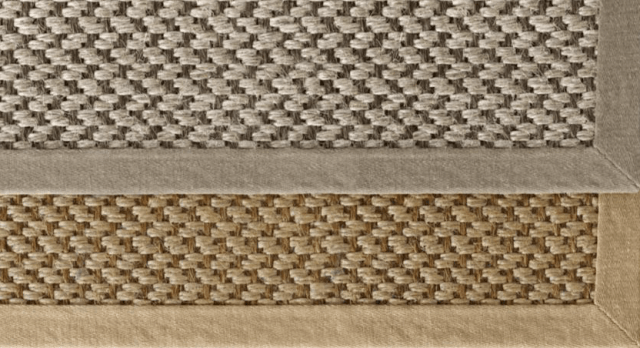 I'm not a wall to wall carpet fan. I love all of the changes. How great that you can do all of this through email. Beautiful! 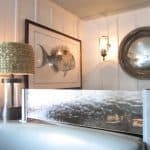 It really is the finishing touches that make a room feel special. Great work! Thank goodness blue and white together are classics – and my faves. 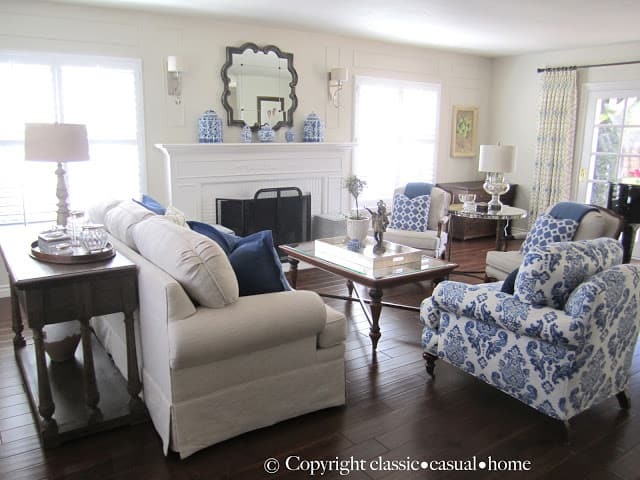 It seems as if color trends come and go so quickly, but we can always depend on blue and white. You know my theory on silver is that it is room jewelry. So very pretty. Blue and white has been on my mind a great deal lately. I may have to find a place to add it into my own home. Classic and timeless. Love it! Fun to see the before and after. A few little changes really make all the difference! I love the blue, white and silver and you are so right as it is so timeless! Gorgoeus room …. well done! So pretty, I love all the details you added it looks much better! Very beautiful room! 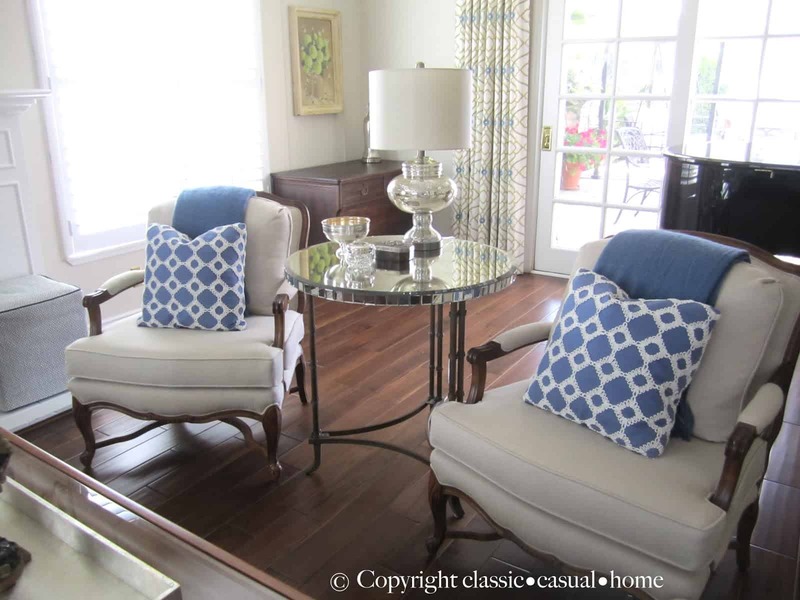 Love the classic color scheme and that damask chair is my favorite! Where, oh where, can I get that fantastic round mirrored table? I love it! Gorgeous changes. Beautiful Mary Ann! So fresh and elegant! Wishing you a happy weekend….. I love this room. Very refreshing and classic style. Beautiful! Blue and white is always stunning! Love the dark wood floors and the mirror hung rather than propped looks so nice. Love the lamps and the tray…gorgeous!! I scrolled back and forth from the before to after photos looking for all the differences and missed the most obvious one – the floor! You were go right – it totally anchors the furniture and looks so classic. 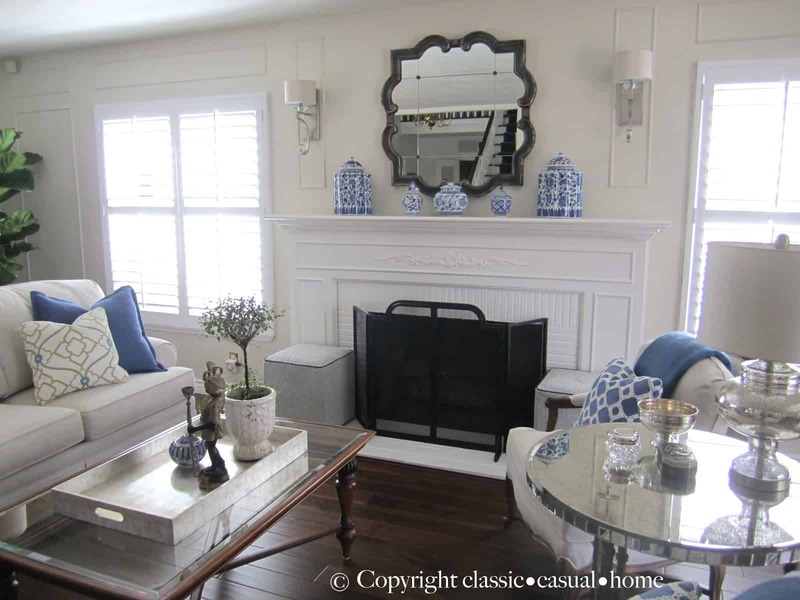 You are both doing an amazing job with the accessories – love the cushions and the blue/white jars on the mantel. Gorgeous. Mary Ann…it looks lovely…I adore all the blue and white. Well….do I have to say how much I LOVE this room? 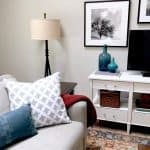 She did a wonderful job on her own with beautiful fabric choices and furniture pieces, but the added touches you helped her with, certainly made this room that much better! It's just gorgeous….both of you did a fabulous job! 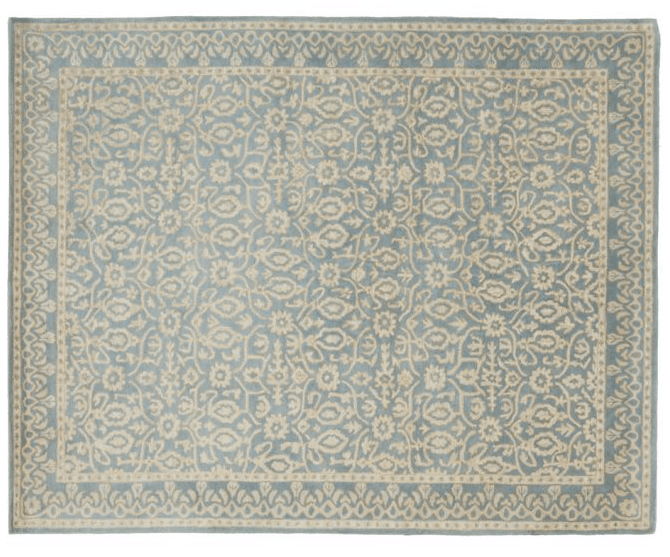 I can't wait to see which rug she chooses. 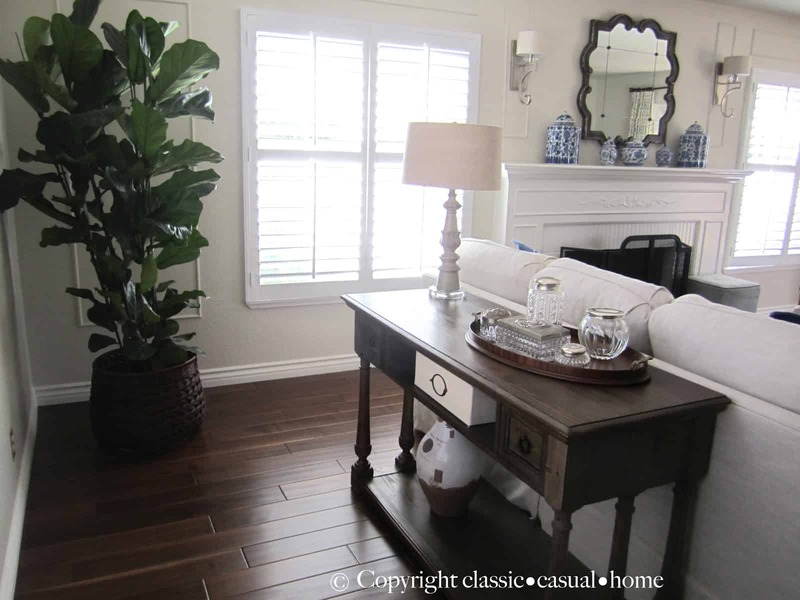 Wondering where she got her beautiful fiddle leaf fig tree….I need to replace mine and am having trouble finding nice ones. Hi Gail….First I have to tell you how much I love your living room too! I have admired it from a far and looked at it over and over again for inspiration. You have so much artistic talent! I got the fiddle leaf fig at a local nursery, Green Thumb (in Canoga Park), unfortunately not that close to where you live. If you're willing to take a drive to Calabasas there is an incredible nursery named Sperlings. It is definitely worth the drive and they also have them. Aren't we lucky to have a Mary Ann if our life! Now on to the dining room. Oh….thank you Linee! Yes, aren't we so very lucky to have Mary Ann! I couldn't have finished my room without her! Don't you love having how she know the perfect touches that complete a space? 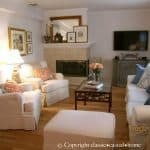 Your living room turned out truly divine! I can't wait to see what wonderful things you both will do in your dining room! Thanks for the info about the nursery. Actually, I do get to that end of the valley often so I'll have to give both those places a try. Mary Ann, Love it all!! She is a smart lady to have used your E-design services!! Love that lamp!!! Wow that is beautiful. I do love classic blue and white. Your touches in this house are perfect. I love love your taste, and your client had some great pieces to work with too. Really. Just gorgeous. I love it ! Gorgeous living room ! What a beautiful room, and yes, the floors make it stunning! Great call on that. You are one talented designer! You really gave it a lift….so much light and shine….the floors are stunning! Love the palette. Do you have a site? You are a rock star my friend!!! 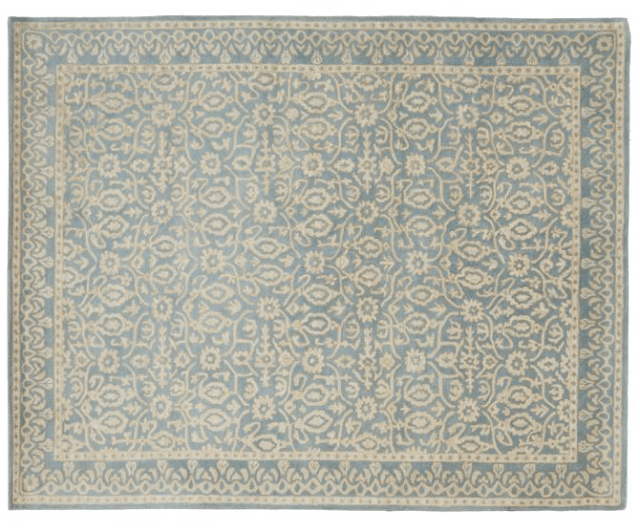 It looks so wonderful- and I couldn't agree more wall-to-wall carpet is the worst! I'm working with someone now who has beautiful B&W patterned wing chairs and we've made over the fireplace, but the carpet-ugh! I should show her this fresh and lovely inspiration. Very beautiful room. Your room is looking so fresh and cozy. I like blue sofa which was inspired me. I have searched a lot from online furniture stores but failed to fined. You are lucky that you have beautiful room stuff. I have one of those blue and white chairs and I’m not sure about if I should do pattern on the floor pattern in the curtains. I love the curtains can you tell me where you got them? Absolutely refreshing and gorgeous! Love everything about this!! Looks so inviting. I am wanting to redecorate my living room just because of the feeling that this room inspires. Love, love, love it!